Publisher's blurb: "Play a character from this book and the experience points come to you. Who said you had to play the good guys? Being evil just got easier. 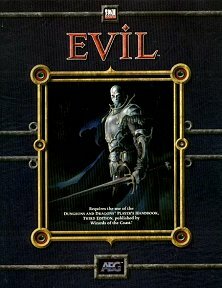 This book has everything you need to run evil characters, develop evil campaigns, and make your nasty NPCs just a little bit nastier. Evil has rules for new prestige classes, new spells, new clerical domains, and demon summoning. If you're playing good after this book is out, you're on the wrong side of the game."